OTTAWA -- Chinese telecom giant Huawei isn't the only company that can build Canada's next-generation wireless networks, the Trudeau government said Monday as China muted its threat to retaliate if Canada bans the company. WATCH: Why is Huawei controversial? Federal Public Safety Minister Ralph Goodale and Innovation Minister Navdeep Bains offered a sharp retort to China's ambassador to Canada, who warned last week of repercussions if the federal government bars Huawei from supplying equipment for faster, more resilient communications systems than cellphone users have now. A Chinese foreign-ministry spokeswoman attempted to play down the earlier remarks by Chinese Ambassador Lu Shaye. The envoy told reporters in Ottawa last Thursday that there would be "repercussions" if Canada bans Huawei from 5G work. Meng's arrest has infuriated China, which has since detained two Canadians, plunging Canada-China diplomatic relations to a new low. Michael Kovrig, a diplomat on leave to work for a non-governmental organization, and Michael Spavor, an entrepreneur, were arrested on vague allegations of endangering Chinese the national security. A third Canadian, Robert Lloyd Schellenberg, received a death sentence last week for a previous drug-smuggling conviction, a harsher penalty than the 15 years of imprisonment he'd already been given. Also on Monday, 140 international China experts -- including five former Canadian ambassadors -- urged President Xi Jinping to free Kovrig and Spavor in an open letter. The letter praises the two men as bridge-builders between China and the world, and said their detentions will make the writers "more cautious" about travelling to China. "Kovrig and Spavor's detentions send a message that this kind of constructive work is unwelcome and even risky in China," the letter says. "That will lead to less dialogue and greater distrust, and undermine efforts to manage disagreements and identify common ground. Both China and the rest of the world will be worse off as a result." David Mulroney, Canada's ambassador to China between 2009 and 2012, was one the signatories and said the letter is significant because it shows the international breadth of support for the two men. "This isn't simply a Canada-China dispute," said Mulroney. "A lot of serious people, including many who have spent years working in China, are worried about how it is closing itself off, and punishing those who seek to understand and interpret it for others." Hua said that Kovrig and Spavor were arrested as part of "compulsory measures by relevant Chinese departments in accordance with the law for their involvement in activities undermining China's national security." 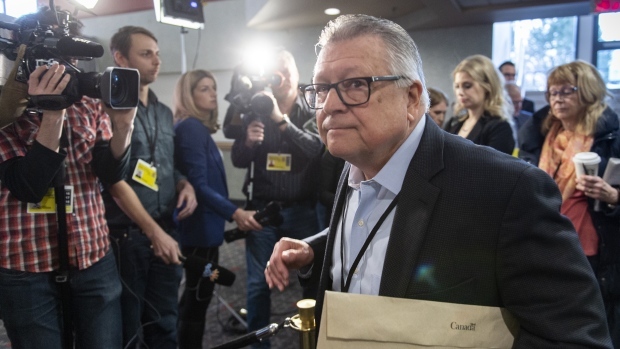 Goodale said while "some people" have linked the detainee issue with the government's decision on Huawei, national security will determine which companies' products will be used to build the country's new 5G network. But he offered no timeline. Huawei has become the world's biggest supplier of equipment used by phone and internet companies. But the company has faced widespread allegations that is it is an espionage organ of the Chinese military and security services -- a charge the company strongly denies.